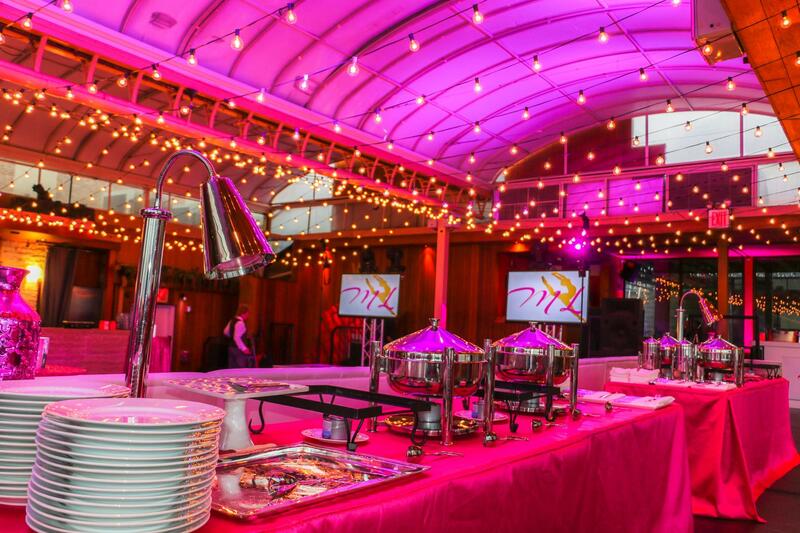 Rent Hudson Terrace | Corporate Events | Wedding Locations, Event Spaces and Party Venues. Whether it’s an intimate private gathering or a large-scale affair, Hudson Terrace, overlooking the Hudson River in midtown Manhattan, is one of New York’s most exceptional full-service event destinations. Featuring a retractable rooftop, 3 distinct room, 2 outdoor spaces and full A/V & Catering. Hudson Terrace is NYC's Premier Multi Room *Retractable Rooftop* Event Space with 3 indoor and outdoor rooms and magnificent Hudson River Views. Hudson Terrace imaginatively unites all the elements with its intimate interiors, magnificent private event rooms and climate-controlled retractable rooftop. Since opening in the spring of 2008, this unforgettable landmark has become the venue of choice for spectacular and unforgettable celebrations of all kinds, from corporate fetes and press events to fundraisers, galas and weddings. -RETRACTABLE ROOFTOP: (Fully weather controlled) for year round use with Hudson River views. Roof opens & closes in 60 seconds. -THE SALON: Beautifully appointed with chic furnishes, Crystal Chandeliers, LED Video Wall & Stage. -GARDEN TERRACE: Outdoor Garden Oasis, connected to the Salon Room, providing an inside / outside event feel with great A/V and lighting available. If you’re looking to elevate your next corporate event to new heights, Hudson Terrace is the place to be. Whether its a fundraiser, media event, launch event , a showcase, or a board meeting, our staff will work with you to ensure that the event you envision is brought to life. You can book a space based on the type of atmosphere you are going for and the setting you want. You can pick from one of our three spacious settings: the rooftop, the salon, or the garden terrace. When paired with our large variety of beer, tasty mixed drinks, top-shelf liquor combined with our delicious large selection of food, Hudson Terrace is equipped to suit your needs. Do not hesitate to contact us regarding your event no matter how small or big. We can accommodate private parties from 50 to 500 guests. by hosting your event on all 3 of our spaces together we can accommodate upto 800 guests, cocktail style. With our ability to customize our space, with lighting, furniture, and set up, we are able to host events of all sizes. Hudson Terrace features 3 unique event spaces for launch / media events, cocktail parties, meetings and conferences – The Salon, The Garden Terrace and the indoor / outdoor Rooftop Garden Lounge. The rooms are set up to host cocktail parties, buffet receptions, general sessions, breakout sessions and seated lunches / dinners in a comfortable, inviting atmosphere. Custom branding opportunities for your company are available via projection screens, custom LED screen chandeliers and a projection wall. A wide array of event layouts (crescent, theater, classroom), coupled with on-site catering and state-of-the-art audiovisual equipment, add to the one-of-a-kind experience of hosting your NYC corporate event at Hudson Terrace. Make your special occasion an unforgettable experience at Hudson Terrace where you and your guests will enjoy the best views overlooking the water, a grand selection of cocktails, along with a delicious array of food offerings. Featuring beautiful indoor and outdoor space, personalized service and the finest amenities, it is the perfect venue for any special event. Our rooms are designed to host events of all sizes and genres, specializing in Mitzvahs, Sweet 16 Celebrations, Bridal & Baby Showers, Holiday Parties, Birthdays, and Anniversary Celebrations. Truly a time honored NYC tradition is to host your Bat or Bar Mitzvah at the famous Hudson Terrace. Kids absolutely love our nighclub like setting, and parents love our A-Z one stop shop of a venue. We provide all of the furniture, lighting, sound, furniture and entertainment. We allow parents to bring in outside vendors as well, making our space one of the easiest to work with.